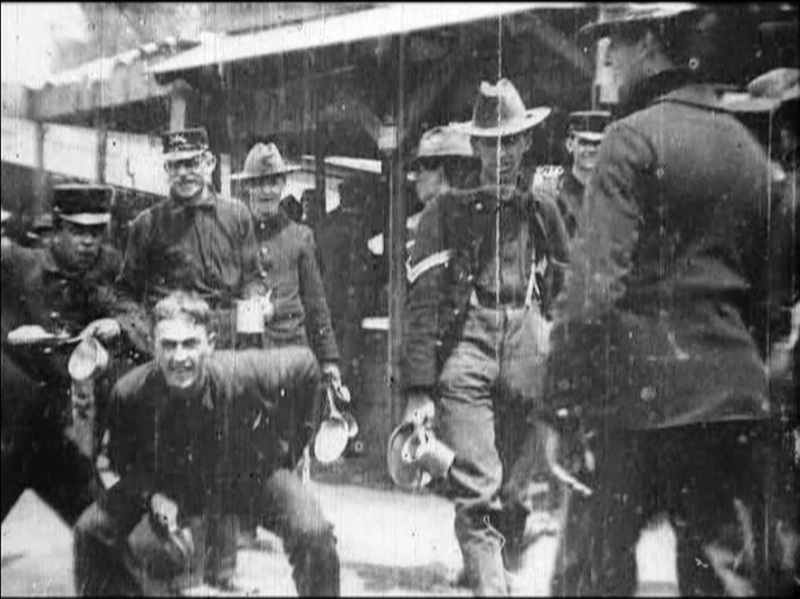 This early actuality short from Edison shows American soldiers at their mealtime. This is one of the first “location” movies made at Edison – most of what came before this was shot in or near to the Black Maria studio on Edison property. What I like about this movie is the very individual personalities of the soldiers that comes through. While some are carrying coffee or trays of food, many seem to be more interested in the camera than in their rations. One fellow is clearly “mugging” and trying to stay in frame as long as possible, and others will wave or make quick movements to get noticed as they pass through. Most of them seem like typical soldiers – good natured, very young and a bit full of themselves, but charming nonetheless. A couple of officers, distinguishable because they are wearing swords, pass through quickly at the beginning, but seem to pay little attention to the men or the camera, but some guys with non-commissioned rank (stripes on their uniforms) join in the fun. By the end of the movie, more people are watching the camera than not. I wonder how many of the families of these servicemen saw and recognized their loved ones through this movie. This is the sort of homey way that Americans might like to think of “their boys” in uniform – not necessarily as effective fighting men or efficient parade-ground marchers, but as naïve and lovable, perhaps even somewhat undisciplined. This may have been part of the point of making the film, to demonstrate how the motion picture could bring people to life over a distance. For us today, it connects us with ordinary people of the past in a more intimate manner than reading about them or seeing a still image could. The title is also the title of a piece of music that is normally played by bugle to signal meal time in military camps.